The first battalion of the Virginia Regiment arrived at Point Isabel on February 18, 1847. The second battalion arrived on March 10th and followed the route of the first battalion up the Rio Grande to Camargo, Mexico. When Captain Johnson anchored the barque Exact on March 1, 1847 at Point Isabel on the Texas coast, Lt. Washington and the other men of Major Early’s detachment learned of Zachary Taylor’s victory at Buena Vista on February 22-23, which, although they could not have known at the time, marked the end of active campaigning in northern Mexico. [ii], [iii] The Virginia Regiment's duty was assigned to that of an occupational and peacekeeping force to prevent uprisings in northeastern Mexico. The Virginia Regiment arrived at Point Isabel by boat near the mouth of the Rio Grande, marched inland and was stationed at various towns, Camargo, Monterrey, Buena Vista and China, in northeast Mexico as an occupation force to hold the area and prevent uprisings. During his furlough, Lieut. Washington, having learned of the victory of General Zachary Taylor at the Battle of Buena Vista, wrote an endorsement of the General extolling his qualities as presidential timber and recommended his nomination by the Whig Party for President. His letter was published in the Richmond Whig and was carried by other newspapers as well. The decision to assign Lt. Washington to recruitment duty was made at Fort Monroe December 14, 1847. [xiii] Lt. Washington was assigned to recruitment duty. In attending to his recruitment duties, the following notice that appeared in the Spirit of Jefferson Dec. 17, 1847. LIEUT. LAWRENCE B. WASHINGTON is authorized by the War Department to receive any number of recruits for service, during the existing War with Mexico. Persons wishing to enroll will do well to make immediate application to him in person or by letter in Charlestown, Jefferson County, Virginia.Dec. 17, 1847 . Also, pursuant to his recruitment duties, Lt. Washington placed the following notice in the Virginia Free Press, January 12, 1848. The Mexican War was concluded with the signing of the Treaty of Guadalupe in February, 1848. 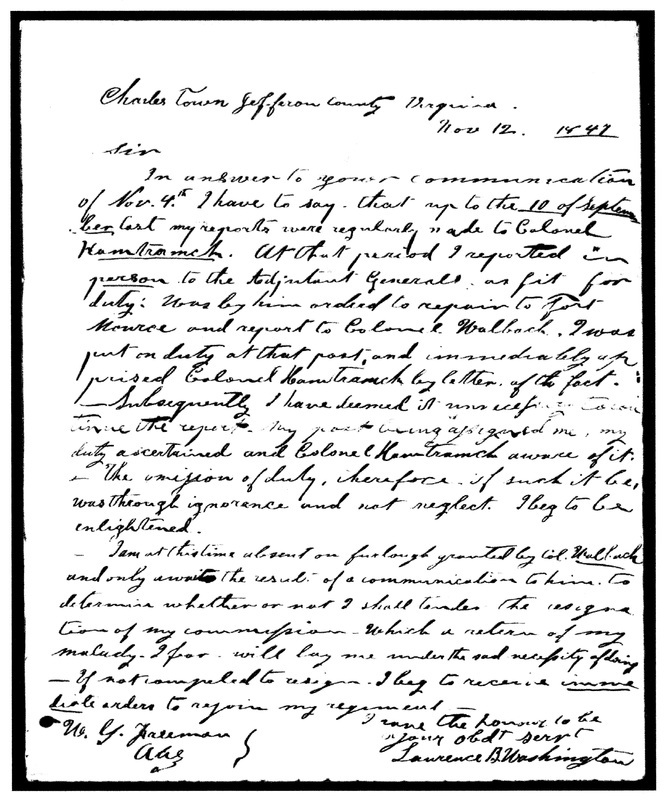 May 7, 1848, Lt. Washington sent a letter to U. S. Secretary of War, William L. Marcy, offering to raise a company of troops to fight Mexican forces in Oregon or elsewhere on the condition that he be granted a captaincy. [xv] The Virginia Volunteers of Captain Rowan’s Company in Mexico returned home the first week in August. Lt. L. B. Washington and the members of the First Virginia Regiment of Volunteers were honorably discharged. [i] Wallace, Lee A., Jr., 1969, The First Regiment of Virginia Volunteers 1846-1848, in The Virginia Magazine of History and Biography, vol. 77, January 1969, pp. 46-77, p. 58-59. [ii] Johnson, William Page II, 2006, Off to War, Heritage Books,Westminster, Maryland, 460 p., p. 23. [iv] Wallace, Lee A., Jr., 1969, The First Regiment of Virginia Volunteers 1846-1848, in The Virginia Magazine of History and Biography, vol. 77, January 1969, pp. 46-77, p. 60-61. [iva] Note of Col. Walbach of Fort Monroe August 16, 1847 appended to Letter Report of Lt. L. B. Washington to the Adjutant General posted at Charlestown, Jefferson County Va., August 8th, 1847. [ivb] Report of W. H. D'Arison, Surgeon, 1st Regiment, Virginia Volunteers, 8 June 1847. [v] Wallace, Lee A., Jr., 1969, The First Regiment of Virginia Volunteers 1846-1848, in The Virginia Magazine of History and Biography, vol. 77, January 1969, pp. 46-77, p. 69. [vi] Johnson, William Page II, 2006, Off to War, Heritage Books,Westminster, Maryland, 460 p., p. 302. [vii] Report of Lt. Lawrence B. Washington, June 8, 1847, Letters received by the Adjutant General, 1822-1860. [viii] Report of Dr. Hugh J. McGiven on the health of Lt. Lawrence B. Washington, 28 July, 1847, Letters received by the Adjutant General, 1822-1860. [ix] Letter Report of Lt. L. B. Washington to the Adjutant General dated Charlestown, Jefferson County Va., August 8th, 1847. [x] Report of staff and Col. Walbach, 16 August, 1847, Fort Monroe, Virginia. [xi] Johnson, William Page II, 2006, Off to War, Heritage Books,Westminster, Maryland, 460 p., p. 302. [xii] Letter from Lt. L. B.Washington to [Capt.] W. G. Freeman, [Fort Monroe], dated Charles Town, Jefferson County, Virginia, November 12, 1847. [xiii] Letter from Lt. L. B. Washington December 8, 1847 and notations thereto of officer at Fort Monroe. [xiv] Letter from Lt. L. B. Washington May 12, 1848, Letters received by the Attorney General 1822-1860.